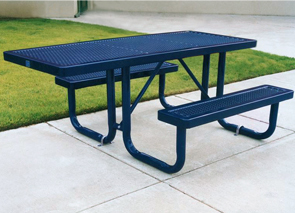 Our 6 ft. Universal Access Outdoor Table offers wheelchair accessibility with one overhanging side. The top and seats are thermoplastic coated 3/4" # 9 expanded metal for all weather durability and have round corners for added safety. Available with a lightly textured matte Polyethylene finish, in the color options shown below. Portable frame is powder-coated. 6' Universal Access Outdoor Tables must be installed with Surface Mount Clamps or In-ground Mount Posts to ensure stability. For extra safeguarding, Surface Mount Clamps and In-ground Mount Posts can be ordered to help protect against the possibility of undesired movement of the table. Other useful accessories include Sleep Inhibitor Bars and an Anti-Vandalism Bar to add extra support to ADA overhangs.